Beautiful uncancelled certificate from Lamoille Valley, Montpelier & St. Johnsburg & Essex County Rail Road Companies of Vermont issued in 1907. 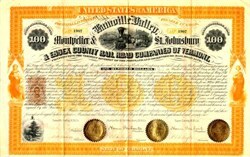 1st Mortgage 6% bond, Issued and uncancelled bond, Black on orange-yellow border and underprint, Locomotive at station. This historic document was printed by the National Banknote Company and has an ornate border around it with a vignette of a train at a busy station. This item has been hand signed by the various railroad companies' Presidents, and Treasurers, and is over 110 years old. 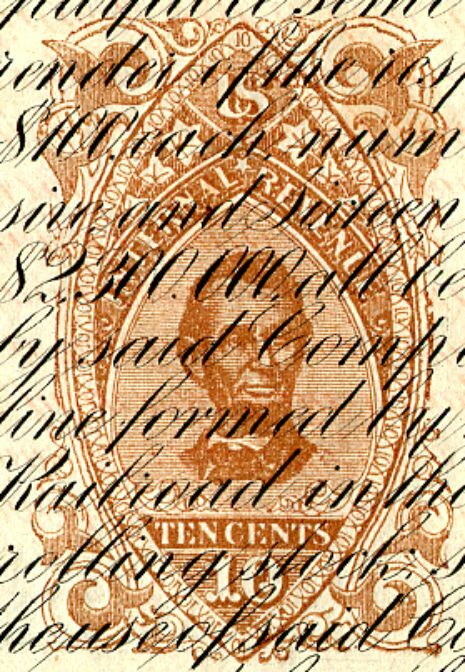 This is the only document on which the Scott #RN-R1 Revenue Stamp 10c brown (Abraham Lincoln) is found.